Sayjel Revell is an associate in Brown Rudnick’s Corporate group and advises on a wide range of corporate and commercial matters, including national and cross-border mergers and acquisitions, venture capital, private equity, corporate re-organisations and other general commercial matters. 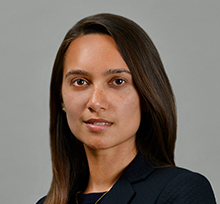 Prior to joining Brown Rudnick, Sayjel was an associate at Willkie Farr & Gallagher LLP in their Corporate/Private Equity team. Sayjel speaks English and French. Representing both investors and investee companies in connection with numerous venture capital and private equity transactions, with particular focus on life sciences, technology and impact investment sectors. Advising family offices and other private investors on a broad range of cross-border transactions, with particular focus on the real estate sector. Negotiating on behalf of buyers and sellers on numerous cross-border M&A transactions involving the acquisition or sale of companies globally. Acting for Queensgate Investments on its sale of London Executive Offices, a serviced office business, to a family office for £475m. Advising an independent French company specialising in packaging solutions for medical devices on an asset sale to one of the world’s largest independent pharmaceutical companies for over €50m. Acting for a New York-based family office in its acquisition of a luxury hotel located on the island of Saint Martin in the Caribbean for over €35m. Acting for a family office in its acquisition of a large shopping centre in Germany for over €100m. Acting for the principal shareholders of Gala Coral in the merger between Ladbrokes plc and the Gala Coral Group. Acting for The Sterling Group in its acquisition of Time Manufacturing, a global leader in the manufacture of vehicle-mounted aerial lift equipment under the Versalift brand. Acting for Zenith Energy, a portfolio company of Warburg Pincus, in its acquisition of a liquids storage terminal facility located in the port of Amsterdam from BP plc. Advising the Special Committee of the board of directors of Eurasia Drilling Company Limited (the largest provider of drilling services in Russia), in relation to a take-private transaction by management and certain core shareholders. Acting as co-counsel to Dexter, a portfolio company of The Sterling Group on its acquisition of AL-KO VT, a producer of trailer components and other similar products.